It's been 4 years now since we've been trying to crack the nut that is the inefficient real estate market in Brooklyn. And now we're introducing a new approach to real estate buying and selling that is unlike anything currently available in brownstone Brooklyn. Our new website HomeCanvasr.com launches today and is an all-purpose real estate platform that allows buyers to claim their search criteria and match up directly with listing agents and homeowners for properties on or off the open market. The site allows homeowners to claim their property and automatically see how many buyers are looking for homes in their neighborhood and price range. It allows listing brokers to post properties they have exclusives on, properties they have leads on, or properties that may never hit the open market place - allowing them to tap into real time buyers as well. So far this year we've consulted on 15 deals that are sold or in contract, and more than half of those were pre-market or off-market listings. That means these deals never hit StreetEasy, NYTimes, Zillow, Trulia, or any other traditional real estate website. Many of these deals had no brokers involved at all, and the buyer and seller could pass the savings of six-figure commissions on to themselves. Some sellers were just "sell-curious", with a price in mind, but didn't want to commit to a listing. On one amazing house in Prospect Heights, we met with one buyer, brought them to that one house, and there was a fully executed contract just a few weeks later. Why does Corcoran have to make $150K+ by jamming themselves in the middle of that transaction? The house is in contract around $3M and could've easily sold for more, but not necessarily net the seller that much more money. There's nothing wrong with Corcoran; they're a huge component of the retail market place. But it is not an "one size fits all" situation. Another deal we consulted on in Prospect Heights for $3.25M was never going to hit the market for reasons personal to the seller. But Platinum Members had their chance at it, and eventually we consulted the buyers who closed on that property for ~$250K less than the on-market property next door. Another deal we consulted on in Clinton Hill that's closing tomorrow is owned by a Corcoran broker who could've had 200 people at his house at the click of a button, but his wife didn't want 200 strangers in their house just to fetch market price. We brought in two Platinum Member buyers, each of whom bid nice prices on the property, and one got that house while another one got a different pre-market opportunity in Clinton Hill. People are constantly intercepting deals before they even hit the marketplace. Curbed is currently touting a listing available on HomeCanvasr.com that we've been scoping for months that is just now finishing its renovation, but has offers that may ensure it never even hits the open market. Talk about beating the open house! We needed to find a way to channel this activity to a platform that's scale-able and crowdsource-able, that allows participation from buyers, sellers, and brokers on their own. The decision to buy or sell a house doesn't happen overnight, but if you find the right buyer or seller, it certainly can be expedited. Many houses are "available" for months before they actually hit the open market. HomeCanvasr.com allows for that. Heck, even our own house is for sale on the HomeCanvasr. We know it's worth a lot more than we paid for it, and we know every broker in town who could sell it, but we don't wanna commit to a listing at this point. However, if a buyer wants to come along and pay our price, we're game! Just like it was for us, HomeCanvasr.com should become the first stop for all sellers looking to tap into real-time buyer data and pricing for their home, with or without a broker's commission. 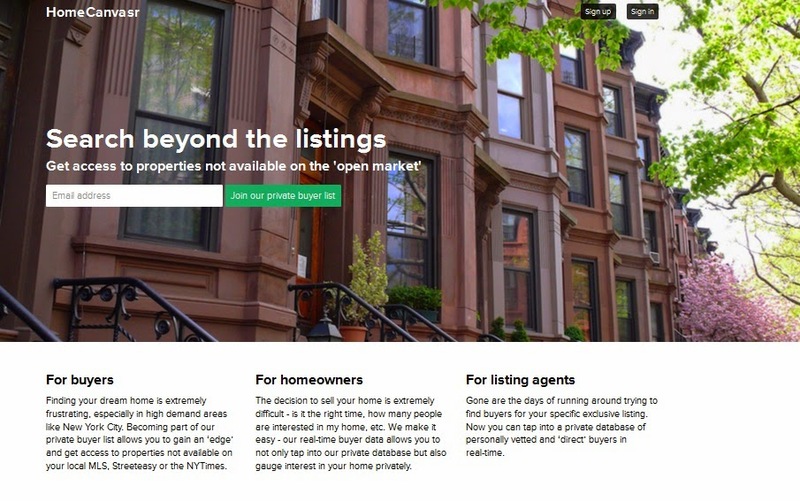 Basically, in an effort to launch a campaign to create a true multiple listing service (MLS) in Brooklyn over the past few years, we found out many reasons why that's not happening anytime soon and whose interests that doesn't align with. Along the way, many people also voiced to us that a comprehensive listing service isn't even what they want. 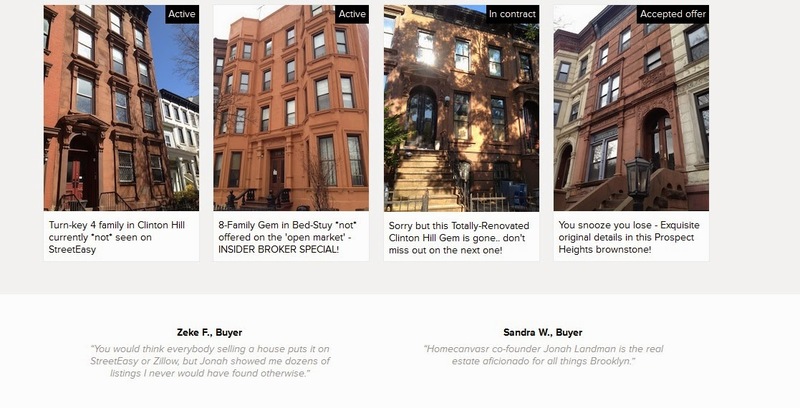 People enjoy our "curated" approach on BK to the Fullest to analyzing and comparing listings. And at the same time, everyone wants that secret 'ish, as Brick Underground was so quick to quote us on. Certainly in the beginning, the main thrust of HomeCanvasr.com will be the pre-market and off-market "secret listings". Buyers specifically want listings that aren't on the open market because of their real or perceived discount off of market price. Buyers who wouldn't pay $3.2M for a huge corner 8-Family building in Bed-Stuy (because it was on the market), bid $4M sight-unseen on a huge corner 8-Family building in Bed-Stuy (currently featured on HomeCanvasr.com) because it's NOT on the open market. Yeah, that's right, people wanted to pay $800K MORE because it's NOT on the market. Different strokes for different folks. And, in turn, many sellers want to sell their house on their terms without paying a broker tens of thousands or hundreds of thousands to bring the same batch of buyers that are already looking for the same set of houses. - no matter how much money you have, no one person, brokerage firm, or website can tell you everything that's available for sale. Think about the implications of that. People with $4M cash in the bank run around like scavenger tenants looking for a studio apartment. To save her life, Barbara Corcoran couldn't tell you how many brownstones are for sale in Park Slope. (Granted, she also sold the firm years ago...) As we pointed out 4 years ago, that's as if Kayak and other travel sites didn't sell airfares out of JFK or La Guardia. - no matter how much money you have, little if any brokers will take you to a listing they don't know they can get paid on. That's why even the richest buyers complain to us that even the best brokers just send them their company's listings and rarely do anything for the buyers that the buyers couldn't do themselves. Brokers know about tons of off-market listings that they aren't guaranteed to make a hefty fee on, therefore they rarely if ever take clients there. That means your own broker may know about the perfect house for you, but won't take you there because they're not guaranteed 6%. That's why people come to us for consulting services because we take buyers to every possible listing (and consistently make less doing $3M deals than what brokers would make on a rental in that same building). We figured there has to be a way to scale this activity, because our bandwidth is only so wide. HomeCanvasr.com is in its early stages, and we expect multiple iterations of functionality and expansion. But for now we already have dozens of listings not available anywhere else on any website, from sellers and brokers you would have to eat, sleep, drink real estate to even have a chance of hearing about. And even then you may still miss these listings. As we've been saying for years, someone bigger than us, smarter than us, more connected and more experienced than us should've cracked the code on this long ago. Yet Brooklyn real estate's inefficient market still needs to be dragged kicking and screaming into the 21st Century, for many nuanced reasons not apparent to everyone from novice would-be buyers to even top brokers who have sold $500M+ in real estate in the past few years. The proposed ways of monetizing the HomeCanvasr.com site have gotten pushback from even the highest up heads of the biggest real estate sites. That's until we tell them we have an off-market listing in the neighborhood they've been looking for, and they practically sign away their first-born child to hear us tell them one address. In this market, the right address can be worth $200,000 (or much more!) of upside. That's why people paid us $2,000 for private consulting to even hear about these leads and listings. Is HomeCanvasr.com's $200 membership fee and $50/month really too much to ask for an increased chance at finding and landing the home of your dreams?